How Did Senator Warren Make $15 Million in 6 Years as a Politician? Interesting. According to this article, Senator Warren’s net worth has been revealed to be at $15 million. She only earns about $174,000 a year as a senator. True, she has book deals (unsure of payments, but according to the math, it would need to be a tremendous amount) and the position at Harvard ($430,000 a year; over 20 years, that is $8 million) that she has been accused of getting a leg up in by claiming Native American status. But how on Earth did her net worth reach $15 million?! As the self proclaimed fighter for the middle class who takes a seat in the 1% the left so loves to vilify, one has to wonder why she is held up as the bastion of hope for the left without a question from any of them. Probably for the same reason they cheer Bernie Sanders’ fighting words about billionaires and their yachts that he made on Twitter from one of his three homes. Elizabeth Warren is the ninth-most unpopular senator in America, according to a new poll released Tuesday by Morning Consult. Fifty-six percent of voters approve of the outspoken Massachusetts Democrat, while 38 percent do not, landing her between Florida’s Marco Rubio and Nevada’s Catherine Cortez Masto. Though Ed Markey enjoyed a 55-percent approval rating, one in five respondents said they don’t know enough about him to have an opinion. With a formidable 75-percent approval rating, Bernie Sanders ranked the most popular senator in America, with fellow Vermonter Patrick Leahy following in second with 70 percent. Maine’s Angus King and Susan Collins, an Independent and a Republican, finished fifth and sixth, respectively. But if she ran for president, she’d suddenly be the most popular woman in America. She is still approved of by 56% of the folks up there. Senator Elizabeth Warren was in the middle of speaking to the Senate when she was referencing a letter that was attacking Senator Jeff Sessions, Trump’s appointment for Attorney General. That was when the Republicans had had enough of Warren and promptly silenced her from speaking out anymore. The letter at the time had King accusing Sessions of “a shabby attempt to intimidate and frighten elderly black voters.” That’s an attack on character if I ever saw. It continued by saying, “Mr. Sessions has used the awesome power of his office to chill the free exercise of the vote by black citizens in the district he now seeks to serve as a federal judge,” King wrote. Again, that’s a blatant attack on Sessions that is indeed a violation of the rules. A senator should know the rules of the chamber, and yet Warren continued to claim that she wasn’t attacking or questioning the conduct of Sessions. She has schemed and lied for the last time against Sessions however, as she is unable to speak out against him anymore. It’s simple. You violated the rules TWICE. If you break the rules, then you have to suffer the consequences. The fact that you were warned about this after the first rule violation, and continued to go after Sessions is either stupidity or intentional. Nevertheless, Warren was warned and she needed to suffer the consequences. The media has been losing their minds over this, yelling about how Republicans are silencing Warren. First off, as usual, it’s OK for the dems to silence people, but an outrage if anyone else does it. Second, she violated the rules and was shut down. That isn’t silencing, it’s discipline. Aside from that, the letter was irrelevant. It stated someone’s opinion, not documented fact. She was using the words and opinions of someone who was not there to agree that she still believed this. Is Sessions a great candidate? No. No one really is. But this is also what I like to call the Paula Deen Effect. Do you remember what they did to Paula Deen? That woman’s entire life was almost completely ruined because of a bad choice of words spoken in anger over 30 years ago. Should she be allowed to apologize and continue on? I believe so. Obviously a lot of folks didn’t agree, and that still seems to be the case. Again, only the chosen ones with a D after their names are allowed to move on after making mistakes or after being complete douche nozzles. Paula Deen was sacrificed so they could pretend that wasn’t so. As for Sessions? Well, anyone with anything other than a D after their name is automatically wrong on everything and must be destroyed. Keep your eyes peeled, folks. Remember, Pocahontas here has her eyes set on the White House. The only reason she didn’t run this time was because she didn’t want to compete with Hillary. Her being “silenced” was great for her. Now she can use the feels of her voting base to play the gender card for sympathy votes. There’s a combo straight from the depths of Hell. Sen. Elizabeth Warren (D-Mass.) praised her colleague Sen. Bernie Sanders (I-Vt.) this week for championing progressive issues as a Democratic presidential candidate. “Bernie’s out talking about the issues that the American people want to hear about,” Warren, who has yet to endorse a candidate, told the Boston Herald for a story published Tuesday. “These are people who care about these issues, and that’s who Bernie’s reaching,” she said. “I love what Bernie is talking about. I think all the presidential candidates should be out talking about the big issues.”Sanders has surged in polls recently as supporters of Warren have moved to back him. Elizabeth Warren: ‘I love what Bernie is talking about’ | TheHill. These two are both a real good example of why progressives should actually be called regressives. Grass-roots liberal movements gave birth to two Democratic stars over the past decade: one who rode a wave of antiwar sentiment into the White House and the other who became the ideological standard-bearer in the party’s fight against big banks and corporate greed. 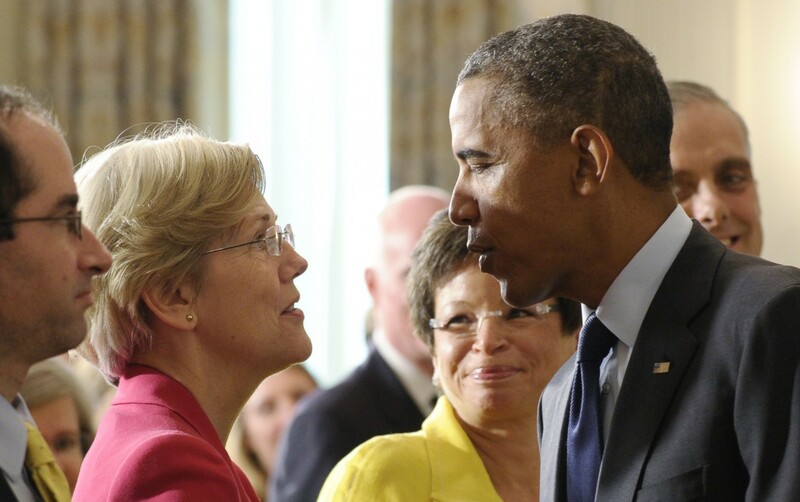 Now, in a battle few saw coming three years ago, President Obama and Sen. Elizabeth Warren (D-Mass.) are locked in an increasingly personal feud over a global trade deal that the president is trying to finalize in his last years in the White House. The clash has become a defining battle for Democrats, as Obama seeks — and Warren resists — “fast-track ­authority” from Congress that would give him a freer hand to cut trade deals. The immediate goal for Obama is to make it easier to win approval of the Trans-Pacific Partnership (TPP), a trade deal with 11 other Pacific Rim nations that would affect roughly 40 percent of the global economy. The Democratic infighting is beginning to shape the economic themes of the campaign to succeed Obama in the Oval Office. Warren has said repeatedly that she will not run but that she is focused on trying to force the likely Democratic nominee, Hillary Rodham Clinton, further to the left on economic issues. Warren appears to have won the initial battles. Senate Democrats on Tuesday stalled an effort to move the Trade Promotion Authority measure as the overwhelming majority of them supported a friendly-fire filibuster. Clinton, meanwhile, has provided almost no cover for Obama on the trade issue even though she played a role in the early talks on the TPP and has long claimed the “pivot to Asia” as one of her most important accomplishments as Obama’s first secretary of state. Against this backdrop, the bad blood between the White House and Warren has spilled into the open. What began with a slight jab at Warren’s trade views — “She’s wrong on this,” Obama told MSNBC three weeks ago — has escalated into a series of daily barbs and retorts carried out on cable TV and Internet interviews, on radio shows and from the official podium at the White House. Feud with Warren breaks open amid ‘fast track’ vote – The Washington Post. 1. She is trying desperately to distance herself from Obama, and what better way to do that then to publicly “feud” with him over an issue? Especially one a lot of voters know little about and won’t look into. 2. Obama is “getting her back” by trying to make her look like a fighter for the people… by publicly “feuding” with her over an issue a lot of voters know little about and won’t look into. I’m thinking we’re going to be seeing an announcement from Warren sometime this year. California is the prototypical example. It has the highest tax rates of any state. It has very generous welfare benefits. Many of its cities have a high minimum wage. But day after day, the middle class keeps leaving. The wealthy areas such as San Francisco and the Silicon Valley boom. Yet the state has nearly the highest poverty rate in the nation. The Golden State, alas, has become the inequality state. In a new report called “Rich States, Poor States” that I write each year for the American Legislative Exchange Council with Arthur Laffer and Jonathan Williams, we find that five of the highest-tax blue states in the nation—California, New York, New Jersey, Connecticut and Illinois—lost some 4 million more U.S. residents than entered these states over the last decade. Meanwhile, the big low-tax red states—Texas, Florida, North Carolina, Arizona and Georgia—gained about this many new residents. So much for liberal policies creating a workers paradise. One liberal economic think tank—the Institute on Taxation and Economic Policy—recently issued a report on the states with the most and least “regressive” tax systems. The conclusion was that states should raise their income taxes on the rich to be more “fair.” Except it turns out that people are leaving the states that the think tank ranks as fair, and they are moving to the states the think tank ranks as economically backward. The least “regressive” tax states had average population growth from 2003 to 2013 that lagged below the national trend. The 10 most highly “regressive” tax states, including nine with no state income tax, had population growth on average 4 percent above the U.S. average. Why was that? Because states without income taxes have twice the job growth of states with high tax rates. Unlike the experts at the Institute on Taxation and Economic Policy, most Americans think that fairness means having a job. Ohio University economist Richard Vedder and I compared the income gap in states with higher tax rates, higher minimum wages and more welfare benefits with states on the other side of the policy spectrum. There was no evidence that states with these liberal policies had helped the poor much and, in many cases, these states recorded more income inequality than other states as measured by the left’s favorite statistic called the Gini Coefficient. The 19 states with minimum wages above the $7.25 per hour federal minimum do not have lower income inequality. States with a super minimum wage—such as Connecticut ($9.15), California ($9.00), New York ($8.75), and Vermont ($9.15)—have significantly wider gaps between rich and poor than states without a super minimum wage. via These Blue States Have Tried the Elizabeth Warren Model. Republicans favor a Warren candidacy for a similar reason. Senator Warren would shift the Democratic primaries leftward. This could make a Democratic opponent less suited to survive a general election. “It is almost like the enemy of my enemy is my friend.” Says Kurt Bardella, a former spokesman for Republican Congressman Darrell Issa. Members of both parties dislike the idea of Clinton coasting to the nomination without any real opposition. Democracy shouldn’t involve a ‘coronation,’ as some call it. Dems and GOP Both Want Elizabeth Warren to Beat Clinton in 2016… But for Very Different Reasons.